Aside from barbecue and beer, what would your favorite from-the-kitchen treat be for Father’s Day? My husband would say apple pie, I responded to my food writer friend’s Facebook query. Apple pie is my go-to dessert for John, although I confess I don’t make it very often. Life gets in the way. We get busy, I get lazy. Plus, who wants the temptation of that second slice before bed or (horrors !) a piece for breakfast in the morning? And, honestly, coring, peeling and slicing all those apples is kind of a pain, not to mention the floury clean-up afterward. So pie baking, for the most part, has been relegated to special occasions—Thanksgiving (pumpkin), Valentine’s Day (I can make a cherry pie, Billy Boy!) and Father’s Day (apple, natch). I sometimes gift my brother-in-law with Lemon Meringue for his birthday, and my friend Jeanie and I are mad for Key Lime. But John loves apple, so once in a while he is deemed deserving—because he’s been working too hard or traveling too much or has been putting up with me—and I surprise him with one. Last Sunday was one of those days. My mom hung up her apron a couple of years ago, but she once was a championship pie maker, winning the blue ribbon for her apple pie at our hometown’s homespun July 4th baking contest. She had a knack for that Crisco crust. My dad liked my mom’s apple pie warm with a slice of cheddar cheese, something that produced eye rolls every time from the teenage me. John’s mom baked yummy apple pies, too. She cooked her filling on the stovetop, often freezing batches for later use, and made an oil crust. Pillsbury has a somewhat acceptable crust and I’ve been known to use it (guiltily) in a pinch, but it feels like cheating, like I’m somehow not living into my heritage. I’ve experimented with a lot of crust variations and have three that I really like, including a Cuisinart crust made with unsalted butter. Silver Palate’s Apple of Her Eye Pie mixes shredded cheddar into the crust. Dad would have liked that. My friend Molly recently introduced me to a crust made with oil and 7-up and rolled between two sheets of wax paper. It tastes fantastic; I’m still experimenting to get the right thickness, and it’s the hands-down winner for ease of clean-up. Speaking of ease, if you’re making it all from scratch, there is nothing “easy as pie” about a pie. I looked up this falsehood and learned that, coined in 19th-century America, “easy as pie” is actually not about the baking of the pie, it's about the eating. And it goes down even easier with ice cream, which the TLC cable channel ranks the Number One U.S. dessert choice. Chocolate cake is second. Apple pie, third. My Auntie Mary, a legendary pie maker, was of an era when people still sat down for a big family dinner, including a roast, potatoes and pie, after church on Sunday. (Obviously, those were the days before youth soccer.) Born in 1895 to Irish immigrants, Auntie Mary wed the son of Italian immigrants around 1925 and lived her whole life in Newburyport. I wonder how many pies she baked for Tony over the years. Which was his favorite? Did Mary ever get aggravated with her younger sister, my grandmother who, oddly, couldn’t stand the "stench" of fresh apples being eaten or prepared for pie (she’d have to leave the room), yet had no trouble lifting forkfuls of the warm, gooey, flaky-crusted, “easy” cinnamon result? Growing up a thousand miles away, childhood memories of my great aunt focus on the kitchen of her cozy little Cape, where a treacherously steep, narrow staircase ascended to the home’s tiny second floor. I picture her wearing a crisp, white apron, perhaps a false remembrance I’ve conjured as I imagine her rolling out a flurry of pie crusts in a hazy cloud of flour. Last Sunday, moved by an inexplicable wave of nostalgia, I used one of Auntie Mary’s old pie pan s. Over the years, I’ve accumulated quite a few basic, clear glass pie plates. So has my sister-in-law. If I bring a pie to their house, Teresa—no slouch in the pie baking department herself--hands me an identical pie plate from her cupboard. No waiting for washing and returning. 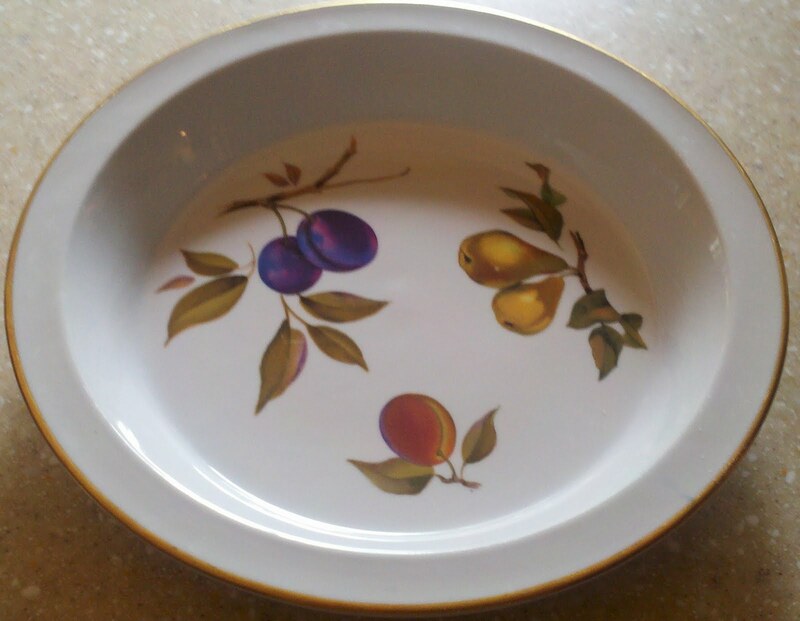 I’ve acquired several pie pans from the kitchens of both my mom and my late mother-in-law, including one that matches my Royal Worcester Evesham china. 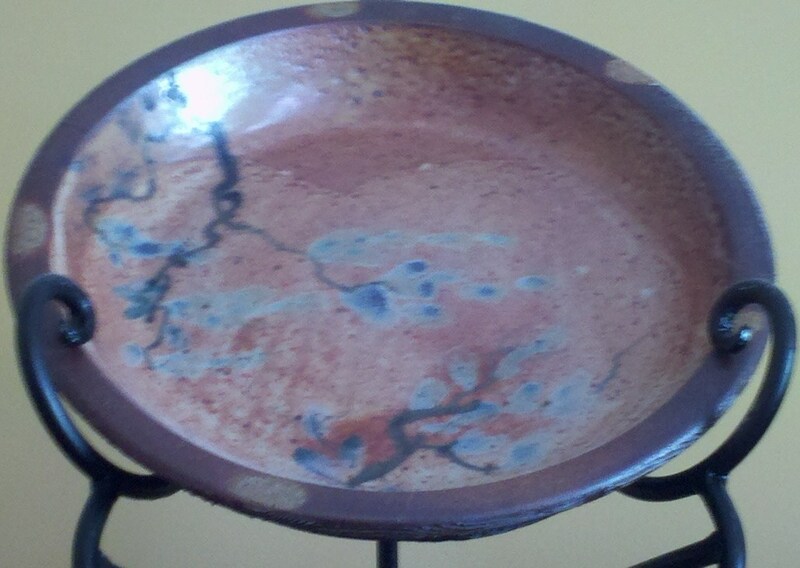 But my favorite is a gorgeous, earthy stoneware pie plate from another sister-in-law, Erica. Created by a Wisconsin potter, David Caradori, the piece is oven proof but I’ve deemed it too nice to use so I show it off atop my dining room breakfront. Auntie Mary’s pan is speckled, grey, vintage enamel—a graniteware piece that I plucked from my mom’s kitchen when she downsized a while back. Collectors Weekly says most graniteware, also called agateware or enamelware, was made from the 1870s until the end of World War II. A pair of St. Louis brothers brought the process home from Germany. After aluminum pie pans hit the market, the once-desirable graniteware lost its proverbial luster. Today, however, pie pans, dippers, coffee pots and tea kettles are all considered collectibles. There is even a National Graniteware Society which holds a two-day convention each summer. Anyone can see this old, dented pan has been well used. I wish I could coax a history from its dappled dings. Curiosity about my forebears has come too late; no one is left to tell me the family secrets, let alone the secret to a perfect pie crust. Surely this pan has stories to tell, like the time Auntie Mary was asked to bring a pie to some event and was confounded because she had never made just a single, lonely pie; she knew only how to measure flour and lard for a half-dozen or more at a time. What’s this piece worth? I wondered. A quick surf to eBay showed prices ranging from seven to thirty dollars. But this old pie tin carries a legacy and you can’t put monetary value on that. I hope I can do it justice, living into my birthright and, hopefully, passing on the pan—as well as the secret to that elusive, perfect crust--to my daughter or, maybe, even my son. With apple pie and cheese. OK. I have an ordered list of comments, FWIW. A. I am with John. Apple pie is my Dave, too. B. I would have rolled my eyes with teenage you, too, over cheddar slices on pie, but something tells me that if I tried it now I would love it. C. Holy cow. I totally forgot how Grammy couldn't stand people eating raw apples around her. That one sentence brought back so many memories!!! 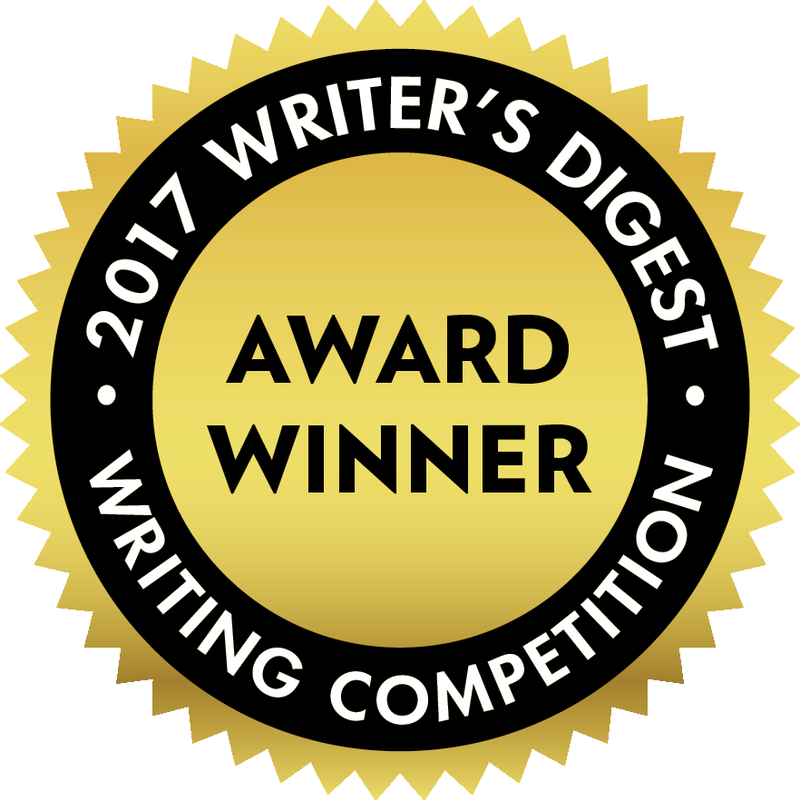 D. Keep writing these, Mims- it is so well written and wonderful. I know this was pie blog, but I must put in a plug for your Pineapple Upside Down cake (smothered in REAL whipped cream, of course!) Possibly, the single greatest food, period. Hi Mary: Thanks for sending those incredible pictures of our apple pies in the window of our school and the American flag flying reflection in the glass. Your blog post about pie is very nicely written and I share much of the same sentiment. 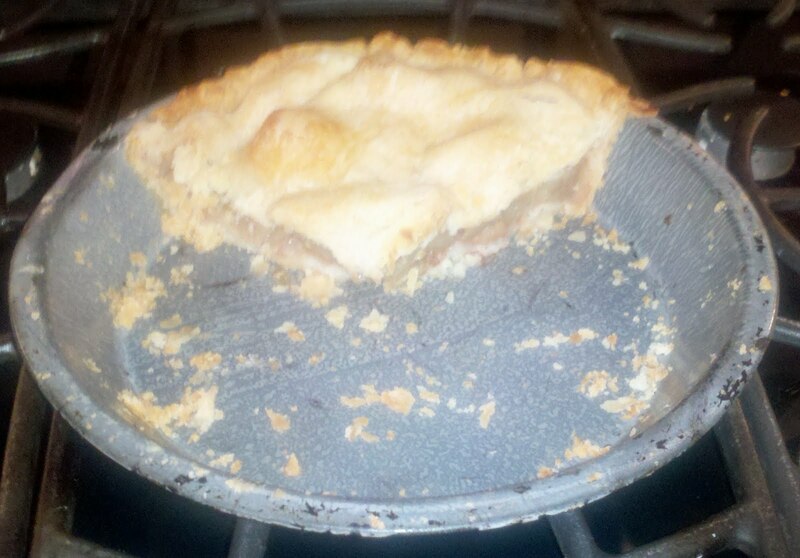 Love the idea of passing an empty pan to the giver--why wait till the pie is done! Hope you guys all come back next 4th of July--love making traditions!